Harold Hikens reports how in 1762, three seamen led a procession round the docks, with drums beating, proclaiming a minimum wage of 40s a month. They were arrested and marched off to Lancaster, the county seat to await trial at the Assizes. As they passed through Maghull, on the outskirts of Liverpool they were helped to escape by a crowd at Maghull Wakes. In August 1775, owing to the American War of Independence, there were 3,000 Liverpool seamen unemployed. Merchants decided to reduce the standard pay for rigging out a ship for a voyage, which was 30 shillings a month. Seamen who had been engaged to rig the Derby found, when they went to receive their pay, that they were to be paid at only 20 shillings a month, and were told that there were plenty of sailors to be had in the port. They returned to the ship, cut down the rigging and left it lying on deck. The rest of the rigged ships in the harbour were treated in the same way. The crowd marched to the Town Hall (which was also the Exchange) with a red flag. They continued their peaceful meetings and marching. A delegation met the Mayor on the fifth day, and later there was a report that the merchants agreed to pay the rates that were asked. However that afternoon the merchants hired a body of armed men at ten shillings a day, and posted some in the Town Hall to arrest the strike-leaders. 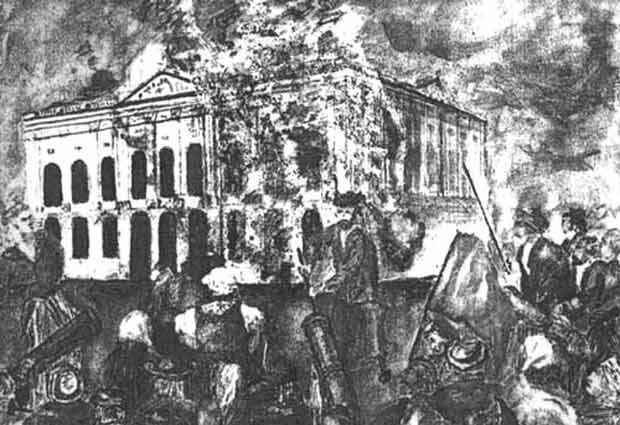 In the evening, they fired on the unarmed strikers who were surrounding the building. The dead were variously reported at two or seven, the wounded at ten or several. The seamen, incensed, went aboard ships collecting cannon, and then put them into position to bombard the Town Hall. They bedecked their hats with red ribbons, raised the red flag, and at 1pm the next day, they began bombarding the Town Hall. Four people were killed. The merchants sent a message to the military in Manchester and two days later 100 cavalry with six officers set off for Liverpool. The seamen were attending the funeral of the victims of the shooting. The troops hunted down and arrested forty to sixty sailors and marched them off to Lancaster for indictment and trial. Hikens comments that the Liverpool authorities would appear to have wished "to forget the whole unpleasant business as much and as soon as possible." Only twelve of the sailors were indicted at Lancaster. Eight were found guilty, but then, all were discharged on agreeing to enlist in the Navy. Of course, that itself was no mild punishment, but they, and many more, would have been executed or condemned to transportation, had they not had strong sympathy in the town at the conditions that brought the revolt. 2. Harold Hikens, The Origins of Working Class Politics, Liverpool, in Building the Union: Studies in the growth of the workers' movement, Merseyside 1756-1967. Two volumes of essays on the Merseyside Labour Movement, published for the Trades Council to celebrate its 125th anniversary. Toulouse Press in 1973. Seamen attack Liverpool Town Hall 1775. Drawing by Bill taken from a print.